Our second French photographer is Romain Allimant, a 23-year-old studying journalism in Paris and a big fan of Saint-Etienne (“Les Verts”), George Best, Johan Cruyff and Sócrates. Romain told us about the nation celebrating World Cup victory on the streets of Paris, refugee football in Boulogne, and the fans of Les Herbiers, who made it to the French Cup Final in 2018. Our second French photographer is Romain Allimant, a 23-year-old studying journalism in Paris and a big fan of Saint-Étienne (“Les Verts”), George Best, Johan Cruyff and Sócrates. Romain told us about the nation celebrating World Cup victory on the streets of Paris, refugee football in Boulogne, and the fans of Les Herbiers, who made it to the French Cup Final in 2018. There are many different people in the photos. 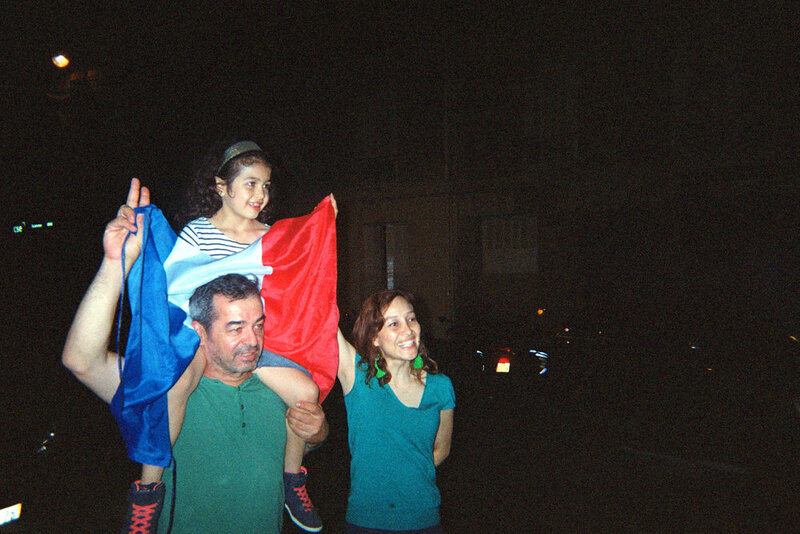 There are people celebrating French victory at the World Cup in the streets of Paris, refugees playing football in Boulogne with French people, and also some supporters of Les Herbiers, a small club that played against PSG in the final of French Cup last year. I tried to show that football unites people. It is a sport shared by many different people and it brings them together. The photos were taken at different places around Paris, at the Stade de France in Saint-Denis (in the north of Paris), in Boulogne-Billancourt (in the south-west of Paris), but most of the photos are from the streets of Paris. I tried to show multiple aspects of football. I wanted to show its social dimension. Small pitches are places where people meet, play against each other and spend a good time. There is one that I find really beautiful, just near the Seine, shaped in an asymmetrical way. The social aspect of football is also present in the photos with the refugees. I think that football is a way to create a link with people. When we play together, we are all on the same page, we are all players sharing the same goal and speaking the same language. Many photos are also supporters celebrating. I wanted to show the emotion and the joy that football can inspire. I’ve always found it impressive how football can drive some people crazy. The four people are looking at the ball - they are focused on it. It shows the attraction of the ball upon the mind and the fascination that football creates. I also find it funny that the guy on the right is wearing a Croatia jersey and carrying a French flag. After the Final, we were very happy that France won but the Croatian team also impressed many French people. Are there any good stories connected with the people or team you photographed? There are two stories I wanted to show. The first one is the Final between Paris Saint-Germain and Les Herbiers VH in 2018. In France, we often say that the French Cup is a competition where small team can defeat the big one and surprise them. We call this small team “le Petit Poucet”. Last year it was Les Herbiers VH. The team plays in the fourth division, the town it represents has a population of less than 20,000. Playing the Final in the Stade de France against Paris Saint-Germain, the biggest teams in the first division, was pretty amazing for them. Many fans came to support their team even though their chances of winning were very small. It was like David against Goliath. But in this story David, Les Herbiers VH, lost. However, many supporters were extremely proud of their team and their players. The second story is linked with an association that create different activities to refugees. People went to a centre that host refugees in Boulogne-Billancourt and proposed to play football every Sunday. It was an opportunity to talk together, to share a moment when we are no longer in a position of “helping” - we were all just players on the same level. On the pitch we all understood ourselves without speaking, communicating with the ball and following the same rules. The bench was a good place to talk, learn about each other and share our stories, our goals and our dreams. These links, all these conversations we shared, were possible only thanks to football. Because it brought us together like no other activity could. Why is football so important for France and French people? What role does football play in France and French society? Winning the World Cup this summer showed us again how football brings people together. It was the same in 1998. There are many supporters of football clubs in France, but it’s only really when the national team plays, and particularly during big tournaments, that everyone is watching. In France, we don’t often sing our national anthem or display our flag. The official matches of the French national football team are nearly the only time when we do those things. Football is a universal language. Its popularity around the world comes from the fact that it is very simple. You just need a ball, or something that looks like it, and you can play. If you bring a ball during your travels, you will see how it is easy to communicate with other people thanks to this sport. That is really what football means to me: it is a link between different people. What is the future of French football? In terms of club football, I hope that teams will be able to compete with Paris Saint-Germain in the next years. AS Monaco, Olympique Lyonnais or Olympique de Marseille are the main clubs that can develop themselves in the future but we also have the LOSC in Lille or OGC Nice that have interesting projects. We have a very promising national team with young players like Kylian Mbappé, Lucas Hernandez and Thomas Lemar. We have also some players that will be more experienced for Euro 2020, such as Antoine Griezmann, N’Golo Kanté and Paul Pogba. We hope that we will win other competitions in the future but we know that the hardest thing is not to win but to keep winning. France will also host the FIFA Women’s World Cup in 2019. Football is more and more popular among French women and we hope that our national team will have a great tournament. It can really help with the lack of recognition that women’s football is encountering, and we all be cheering for them next summer!